The Porsche 911, type 993 represents the final configuration of the legendary 911 series. Back in 1993, the Porsche engineers and designers began work on the type 993, smoothly resculpting the body, redesigning the now 282 horsepower flat-6 engine, and adding a totally new suspension. 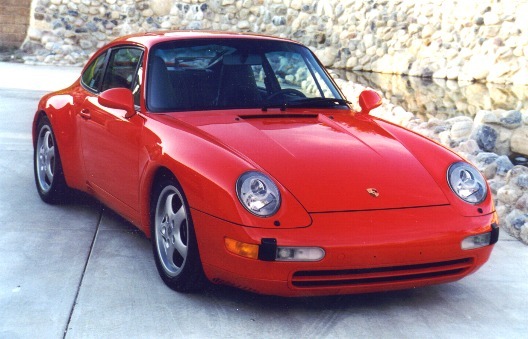 The result was released in the form of a 1995 model, "The New 911 Carrera." The 911 Carrera was just what Porsche needed. The previous 911 had generally remained unchanged for over 20 years, and lack of sales pushed for the need of a "total" redesign. As you look at the Carrera, its valoptuous curves never end, front fender flowing into the smooth headlamp, then on across the windshield, to the rear where the softly flared rear fender wraps around the taillights only to continue around the other side. Only the Cabriolet is more stylish, offering the same great performance and the exhilarating quality of open-air motoring. Bore and stroke: 3.94" x 3.01"